A book entirely devoted to the trick that fooled HOUDINI! That's right! 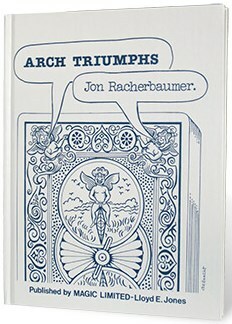 One of the world's finest card magicians, Jon Racherbaumer, dedicated to the "Triumph" premise. This book contains history of the Triumph created by Dai Vernon. 13 ORIGINAL great routines are outlined in Jon's personal inimitable style. This book is the real deal. Get an original hard-bound copy of this 44 page 8.5 x 11 masterpiece today! + A wonderful section on further reading and an extensive bibliography. Also included are the Deal Down Triumph by Fred Braue and Joker Switch by Ed Marlo.